Japan has four distinct seasons. The climate can widely vary depending on the region you visit as the country is long from north to south. Honshu, Shikoku, and Kyushu have extra tropical climates, Hokkaido has subarctic climates, and the southern islands such as Okinawa have subtropical climates. For example, springtime skiing can be enjoyed in the northern areas between March and April, but sea bathing can be enjoyed during the same time of the year on the islands in the southwestern areas. Japan also has particular climactic events such as a rainy season and typhoons. All of Japan is in the same time zone, 9 hours ahead of G.M.T. No Daylight Saving Time is practiced in Japan. 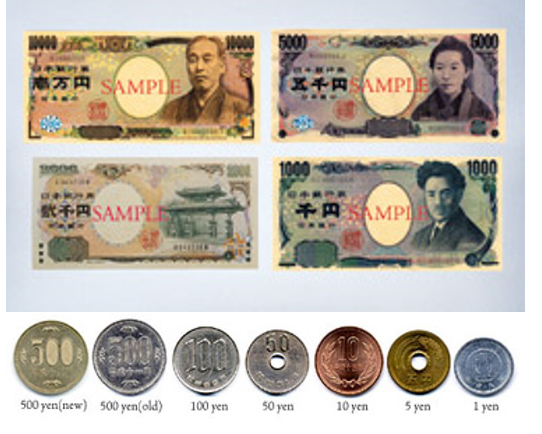 The currency of Japan is written "円". Its currency sign is "¥" and is written "Yen" or "JPY" in foreign characters. Consumption tax in Japan is 8%. Currently, whether indicated prices are tax-included or not is up to the store. Please ask the staff if the prices include tax or not before making your purchase if you would like to know how much you must spend. Credit, debit and prepaid cards of International brands are acceptable at wide variety of merchants. There will be instances where merchants may not display the card acceptance marks so do not hesitate to ask the salesperson if your card is accepted. You can use cards for Narita Express (JR) and Shinkansen (JR) fares; however, may not use them to pay for most of short distance train/subway fares. You can withdraw cash nationwide at ATMs in Japan Post Bank and in Seven Bank. Also, most accommodations are internet-ready, but you might sometimes find a wired internet connector in your room. In such case, please use a wireless travel router. If your budget allows, hiring a mobile hotspot device at the airport is another good option. You can use it in any areas the mobile covers. Japan is known for its clean, safe urban areas and for the quality of its healthcare and public safety infrastructure. Still, as is the case with travel in any unfamiliar place, it always pays to exercise common sense, and to be familiar with the resources at your disposal should you experience problems or need assistance.